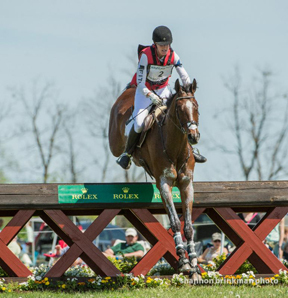 Selena O’Hanlon, Olympic and Pan American Team member from Kingston, ON, rode into the top ten at the prestigious 2014 CCI 4* Rolex Kentucky Three Day Event presented by Land Rover held April 23-27 in Lexington, Kentucky, USA. Aboard John and Judy Rumble’s Foxwood High the, 11-year-old Canadian Sport Horse gelding, [Rio Bronco W – Evita II] O’Hanlon earned 56.8 penalties in the dressage test landing in 27th place. But it was the pair’s answers to the hard questions asked by Derek di Grazia’s 4* cross country course on Saturday that added only 1.6 time penalties to their score and moved them up the ranks into 14th place. O’Hanlon and Foxwood High’s clear round over Richard Jefferey’s show jumping course which saw a single time fault added to their score which moved them up into 10th place on a final score of 59.4, earning them one of the highly coveted top ten spots. O’Hanlon’s second mount, Bellaney Rock, a 15-year-old Irish Sport Horse gelding O’Hanlon co-owns with Eventing Canada, stood in 28th place after dressage on a score of 57.0 penalties. The pair had an unfortunate runout at the ‘Head of the Lake’ during cross-country resulting in jump and time penalties accumulating a score of 95.8. O’Hanlon and Bellaney Rock took two rails for eight penalties in their show jumping round for a final score of 103.8 to finish 30th overall. For O’Hanlon’s full commentary, watch the interview here. 2012 Olympian Hawley Bennett-Awad of Langley, BC completed her eighth CCI 4* event on Gin N Juice, the 14-year-old Thoroughbred mare [Audio – Qtrapastree] she co-owns with Linda Paine. On their first day of competition Bennett-Awad earned a dressage score of 58.7 penalties landing 31st before heading into cross country where the long-time partners proved their experience when they were one of only 19 competitors to go double clear bumping them up to 15th place in the standings. On day three they saw eight jump faults added to their score in the show jumping jump round for a 16th place finish with a final score of 66.7. Canadian 4* rookies, Rachel McDonough and Irish Rhythm, her 15-year-old Canadian Thoroughbred gelding partner, [Vice Chancellor – Dawnsari] completed their first 4* Rolex Kentucky in 25th place. McDonough of Etobicoke, ON, admittedly started her competition “full of nerves”, and their dressage bore that out as the pair scored 67.8 penalties placing them at 51st. The duo regained their confidence over cross country delivering a double clear performance which moved McDonough and Irish Rhythm up the ranks into 24th. They completed the competition on Sunday earning 16 jump faults in their show jumping round for a final score of 83.8. Peter Barry of Dunham, QC and his 2012 Olympic partner Kilrodan Abbott, the 15-year-old Irish Sport Horse gelding [Clover Brigade – Gentle Lassie] co-owned by the rider, and Susan and Dylan Barry, completed their fourth consecutive Rolex Kentucky in 33rd place. The pair started the competition in 43rd place on a dressage score of 63.5 penalties. They continued to the second phase over cross country incurring one refusal and time penalties for a score of 104.3. Barry and Kilrodan Abbott completed the competition by nicking one rail for four faults in their show jumping round earning a final score of 108.3. Canada was one of seven nations represented at the 2014 edition of the Rolex Kentucky Three Day Event which is a qualifier for the 2014 World Equestrian Games in Normandy, France August 27-31. The Canadian team was led by International Technical Advisor Clayton Fredericks and Chef d’ Equipe Graeme Thom. Full results are available on the official Rolex Kentucky Three Day Event web site www.rk3de.org.